Should people, companies and other institutions be made responsible for the deforestation in Cameroon and compensate those who are remedying it? Masango Sone, CEO and founder of Green Cameroon thinks they should. A more than 60% loss of the rainforest's elephant population proves him right. The deforestation rate in the Congo basin has reduced to 0.3 per cent of the annual forest loss, in 2013. But despite this, Cameroon and countries of the forest zone have a lot of reforestation progress to make, since the rainforest has lost more than 60% of its elephant population, which are considered by Blake and Campos-Arceiz, (authors of a paper on African and Asian elephant seed dispersal in Acta Oecologica) as, “the ultimate seed dispersers”. However, as momgabay.com revealed, agriculture is the major drive to deforestation in a special dossier centred on the Congo basin in 2013. Today, Cameroon cannot afford the luxury to count on elephants and other wild animals for tree spreading and planting as this was the case in the past. Reports from the World Traffic Fund, the International Union for Conservation of Nature (IUCN), Traffic and the Worldwide Fund for Nature (WWF) say more than 1,000 of these precious mammals were poached in the country between 2008 and 2013. 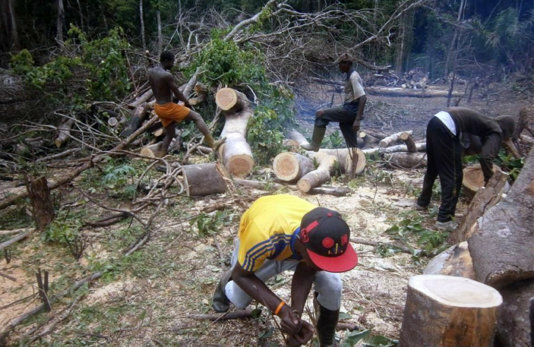 Cameroon now has to rely on the population, forest activists or NGOs to save the fallen trees. The country needs people, who are conscious of the dangers of deforestation and the utilities of the forest to the people and to our planet and are doing something to solve this problem. Cameroon needs leaders with strong will and drive for conservation and reforestation. Masango Sone is the CEO and founder of Green Cameroon. 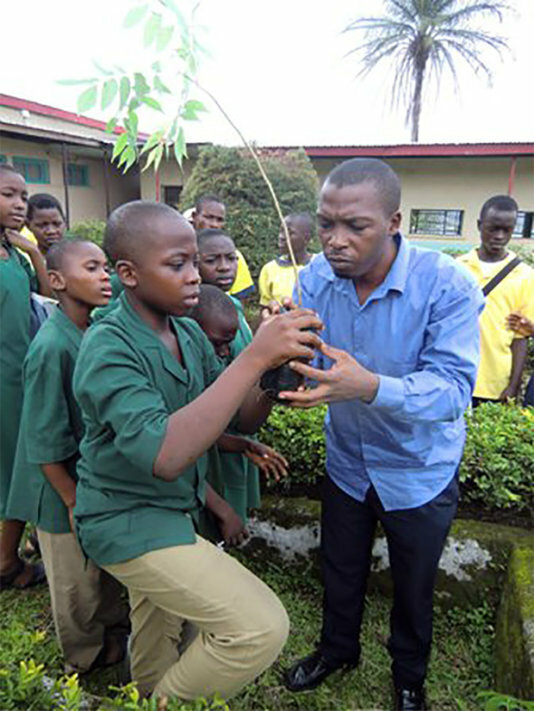 Since 2003, his organization has championed a reforestation movement and has been promoting green-sustainable practices in schools and poor communities in Cameroon. Last week, in a phone and a mail interview with Mr Sone, he told us his organisation “has planted more than 5,000 trees in communities, schools and other deforested lands” and has succeeded to reach 5,000 youths in schools with environmental outreach campaigns. Green Cameroon knows planting a tree is not enough; but enabling farmers to benefit something from them can make the activity interesting and sustainable. The organisation has been helping farmers in different ways and in many localities in Cameroon. 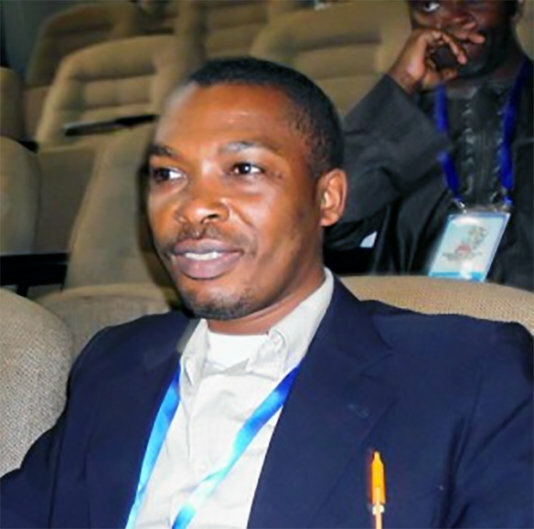 Peter Ngwe Ekan is a farmer in Buea, capital city of the South West region of Cameroon. He revealed to Supreme Master Television, an international, non-profit channel airing constructive news, Mr Sone’s organisation provided him “with seedlings for banana trees..., and seedlings for ...live fence to protect my crops. Previously, I didn't have anything in the garden until they (Green Cameroon) provided me with the seeds for the bananas. So after planting them, I have been harvesting and the crops are doing really well. I am really grateful to them,” he added. Also, Mr Sone disclosed, besides having the difficulty to “keep the trees alive after the planting exercise, persuading community members to accept some trees to be planted in their communities, and finding funding for most of our planting programmes” his non-profit environmental organisation does “not receive any support what so ever from the government". However, the founder of Green Cameroon thinks apart from encouraging tree planting, international bodies and decision makers should “also be looking at ways of getting those responsible for deforestation answerable for their action while looking to compensate those who are remedying it. I am trying to say the polluters should pay the conservationists,” he concludes.